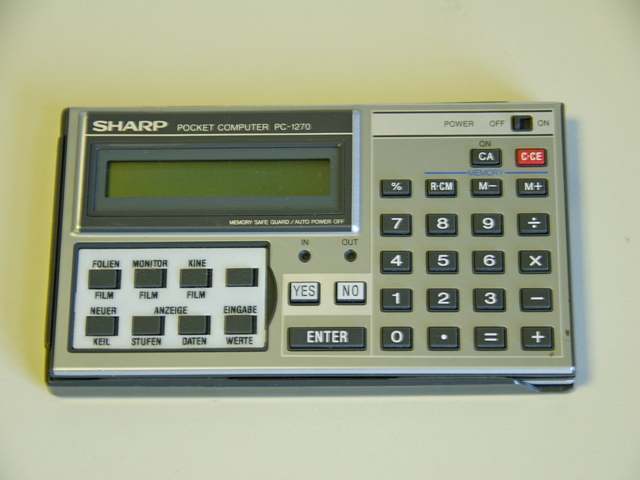 The Sharp PC-1270 is a run-time-only pocket computer that executes programs written in SBC BASIC. It can execute complex, lengthy programs and yet provides an extremely easy-to-use and un-intimidating interface for the user. It is a "dedicated purpose" tool that is quite powerful yet very cost-effective. The programs installed in the PC1270 cannot be changed, deleted, or even read by the user. With the PROM CF-Series Flash cards, the program is stored permanently and will not be lost even if the calculator's batteries are completely dead. The calculator uses a very accurate arithmetic calculation method that is ideal for financial and insurance institutions. Complex financial calculations can be performed with 10-digit floating-point BCD precision.